Organic. No additives. Crunchy snack packs. High in fibre. 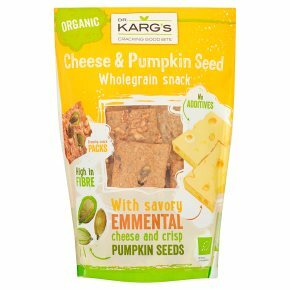 With savory emmental cheese and crisp pumpkin seeds. Pumpkin seeds: wit a deliciously mild nutty aroma. Sprinkled with crisp pumpkin seeds. Emmental cheese: made with lots of milk and given time to mature. Deliciously intense nutty taste. Natural product being free of additives. Wrapped oven-fresh. Suitable for vegetarians.